If you are looking for a gourmet meal, this Filet Mignon is it. It's topped with shrimp and crab with a delicious wine sauce. A little bit of work will be worth the effort when you taste this melt in your mouth tender filet with this topping. It's an elegant perfect special occasion dinner. Easier than you think to make and everyone will think you ordered this from a 5 star Restaurant. Scroll down to get this yummy recipe. Please let me know if you try it! This gourmet meal is super easy to make and looks like you went to a 5 star restaurant! You may want to add some bread sticks to dip in the delicious remaining wine sauce. When I made this for my husband, he in awe of how this tasted and loved it. We are both big seafood lovers here, this was just an over the top meal. Then I made this delicious cheesecake for dessert. I took the easy way out used my slow cooker cheesecake recipe, it was so decadent! We usually buy around 2 lbs of extra crab legs, so we will have an additional surf with this turf. creamy bacon potatoes or just add a fresh garden salad. We love surf and turg! Of course you can cook whatever cut of meat you like. Even though this is a very tender cut of meat using the filet mignon, a more flavorful cut would be a boneless ribeye. I have used ribeye in the past also, you can improvise with anything you like. Start out by grilling on high heat! Make sure you start out with high heat for a good sear to lock in the juices, then lower the temp and cook the meat how you love it! I like to get a good looking char on my steak on both sides and pink in the middle, my husband likes his medium rare. One tip I can give you, I use a meat thermometer as I surely do not want to ruin this expensive filet mignon by guessing. You can top this with just crabmeat, all shrimp, lobster meat or scallops. Any kind of shelled seafood goes great with this dish except I am not too fond of clams. There is no right or wrong, make the seafood you family enjoys and any combination. This buttery sauce is amazing. 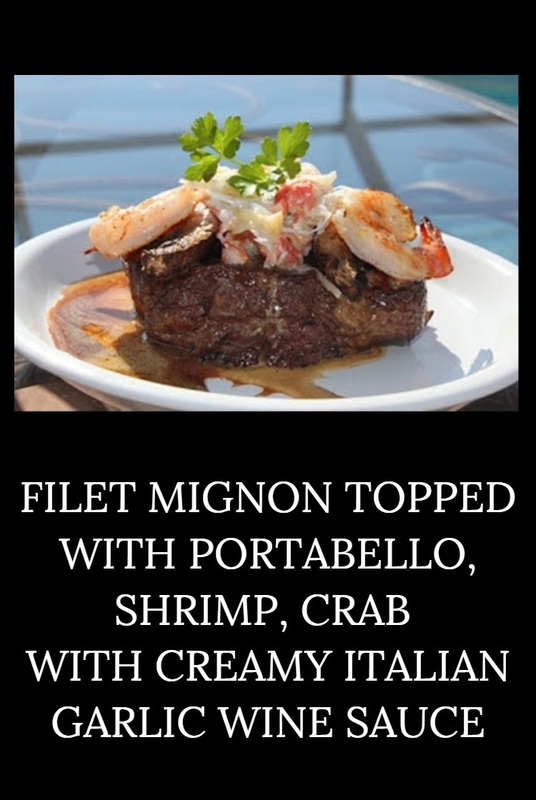 You will love how it enhances the seafood topping and melt in your mouth steak! Any garlic bread or bread sticks are great dipped in this marvelous wine sauce. Make sure you watch the garlic closely. Burnt garlic is the worse taste and smell to me! It should just be sauteed on very low heat just until it starts to get golden, not browned! Then add whatever is needed next. This filet mignon meal is usually for an anniversary dinner or special birthday meal. Of course it's a little pricey to make any day of the week. I always like to make something over the top like this dish when it an important day. This Filet Mignon meal is easier than you think to make. Our family loves seafood and steak combinations. This is made on special events and occasions and particularly wonderful for a quiet anniversary dinner! If you can't grill it's ok, just broil or pan fry your filet in your home in some butter. Even cooking on a cast iron griddle skillet works well like I do my burgers! The seafood can be prepared in a fry pan and sauteed in butter. Get a grocery list of what you need first! I always make a list of the ingredients. The last thing you need is to run out of something in a brand new recipe. I love using all fresh ingredients but if you get canned crab meat get a good premium grade. I usually buy fresh crab and take it out of the legs to put in my wine sauce. Look for the best cuts of meat! Filet Mignon Topped with Portabello,Shrimp,Crab with Creamy Italian Garlic Wine Sauce, isn't an inexpensive meal. Make sure when you are purchasing the meat, you find a well marbled piece of meat. The filet has less fat but you do want some fat in it for flavor. I just love this combination of flavors, especially this butter sauce. This is a gourmet meal fit for a King! I know some folks are allergic to seafood. You can add vegetables on top if you want to substitute the seafood. Asparagus works well with the wine sauce and so does spinach. This filet mignon can be tailored to how you and your family like you steak. Just portabello mushrooms is fine too. The meal will still taste like you are in a 5 star Restaurant! This is gourmet meal and taste like it came from a 5 star Restaurant. 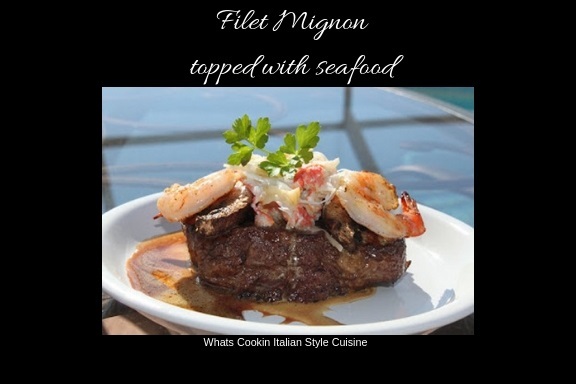 The filet is topped with a delicious wine sauce over seafood. Saute the minced garlic in one tablespoon butter and 2 tablespoons of olive oil till just turning golden. Remove half of the garlic to put on top of meat, shrimp and mushrooms. Boil a pound of crab legs, remove shell and retain meat in a small bowl. On a hot heated outdoor grill on high heat, add a dab of butter on both sides of the filet's, add salt and pepper, sear meat on both sides. Lower heat and cook to your desired doneness. Grill portabello mushrooms and seafood of choice, scallops, shrimp, lobster on the grill seasoned with salt pepper and butter. These cook fairly quick, set aside. Use remaining sauteed garlic, add wine in a small heavy frypan on low heat and boil to reduce wine to half. Stir in the heavy cream, bring to a low boil till smooth. Keep on low heat, add the butter, to the wine, stirring with wooden spoon, continually till butter is melted and wine sauce is slightly thickened . I always double this recipe as we love the sauce with extra crab legs to dip them in. 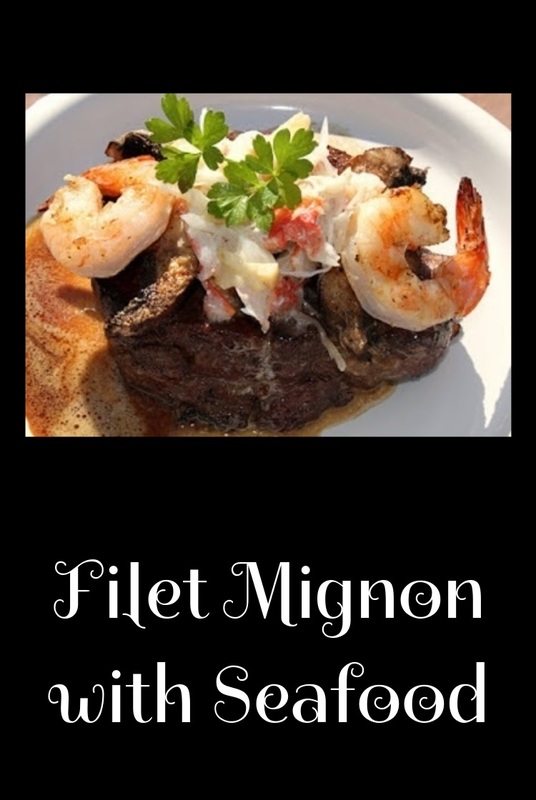 Place filet on a plate add slices of portabello mushrooms, shrimp, crab to center of the filet, add white wine garlic sauce in a generous portion over the top of each filet. Add parsley garnish and serve. okay I will please take all of that right now. I am dying to grill, and was going to this weekend, but it was under a mound of snow at my moms! love everything about that meal! looks like it melts in your mouth! There's a whole lot of love on that plate~and what a nice opening shot too! Looks super delicious. Hubby would die for this one! In fact, he came home today and said he's buying me a new gas grill! When he does, I'll be trying ths. Absolutely mouthwatering! Who wouldn't devour this dish! A fabulous surf and turf dish, I love it! The creamy wine sauce sounds amazing! Hello my darling little chef, what a delicious, fillet Mignon! Exquisite preparation and presentation! Excellent!Compliments! Grumpy would think he had died and gone to heaven with meal like this! Something for everyone on that plate! Love me some filet and with the "surf and turf" style indeed! But will be waiting patiently until after Lent to enjoy red meat again. Wow! It's all there. The sauce is incredibly scruptious. Surf and turf. Kudos! This is an absolute feast! Your photos are stunning and make this dish all the more inviting. This is definitely my kind of meal. WOW!!!!! GORGEOUS AMAZING! I want to eat the screen!! Fillet with portabello, a garlicky creamy wine-y sauce, this is scrumptious! Time to fire up the BBQ. Hi! I came over from Claudia's blog. This meal looks fabulous! All my favorites in one dish! This is one of your most fabulous recipes yet! Must have been a very special event! Saving this for our next dinner party! Delicious!! I love surf and turf too - and making it at home is the best way to enjoy it! The weather in summer here in Scotland is usually pants, with lots of rain and very little sun, but this year we are having a fabulous summer so the BBQ is out a lot. Can't beat it. This is my kind of dinner! Looks so perfect for a date night in! This is like the ultimate date-night-at-home dinner! So fancy! Thanks for sharing the recipe! This looks amazing---the perfect dinner for date night or any other special occasion.My husband would love this-- How can he not with all that delicious surf and turf on one plate. AMAZING! Definitely going to make this for my fiance and I on our next stay-in date night! So fancy and delcious! This is my kind of dinner and so perfect for special occasions! This is the perfect meal, IMO! So much flavor in one dish! Oh, that butter sauce with the garlic. Yum! Filet Mignon is my go to celebration steak. All kinds of favorites here! What a meal! It may be 5 AM here, but i'm ready for steak! This looks amazing. I like ribeye when i grill steaks! This would make a perfect date night in dinner! I think my husband would fall in love with me all over again!! Sounds delicious. Like the addition of seafood and that buttery sauce. This is like a dream meal we have once in a long while. I always crave this kind of recipe, but just think I am crazy half the time. It looks amazing. This is an epic dinner. We love steak and seafood! Thanks for sharing. I love seafood, I like the presentation of this recipe. Looks incredibly delicious! I would like to try your recipe for dinner. Oh God, this recipe makes me crazy! This is really a great job! You are a genius! A great combination of ingredients and I'm sure it's really tasty. Perfect date night recipe. Who doesn't love a little surf and turf? Definitely going to save this for special occasion. Ain't nothing like a good piece of meat cooked to perfection. This sounds absolutely heavenly. The flavors sound wonderful. That is a party worthy dish. Surf and turf, at it's very best. Looks delicious and love your presentation. We are big meat eaters plus seafood lovers. What a great meal -- it would certainly be part of a celebration menu. Will have to save this for our date night. This looks like the perfect special occasion meal. I could see serving this for our anniversary dinner or even a fun new years eve dinner. This looks sensational!